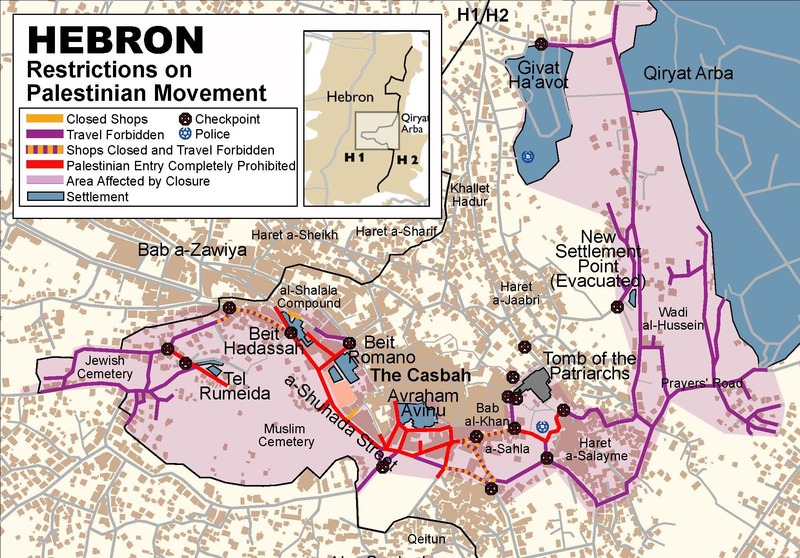 Map of the restrictions on Palestinian Movement in Hebron, August, 2011. Source: B’Tselem. To have future for Palestinian refugee camps, we need to undo what I call “spatio-cidal” Israeli colonial project in the Palestinian territories. “Spatio-cidal” (as opposed to genocidal) targets land for the purpose of rendering the “voluntary” transfer of the Palestinian population inevitable. Spatio-cide is a deliberate ideology with unified, albeit dynamic rationale because it is in constant interaction with the emergent contexts and actions of Palestinian resistance. Spatio-cide can be understood primarily as the confiscation of lands in order to construct Jewish settlements, house demolitions and population transfers. Spatio-cide involves a mix between three strategies. Firstly, to paraphrase Kenneth Hewitt, spatio-cide involves “space annihilation,” or a mass destruction of the space, similar to that witnessed in Europe during World War Two with the destruction of Dresden, Hiroshima, or settlements in north-west France, though obviously the execution is different in Israel’s case, such as the destruction of the Jenin refugee camp in 2001.¹ The second strategy of spatio-side is ethnic cleansing, Ilan Pappé has demonstrated was, historically, not a circumstance or consequence of war, but rather a purported goal of combat for early Israeli military units led by David Ben-Gurion.² Since 1967, this strategy has prepared the grounds for dispossession by creating Jewish settlements within Palestinian territory. 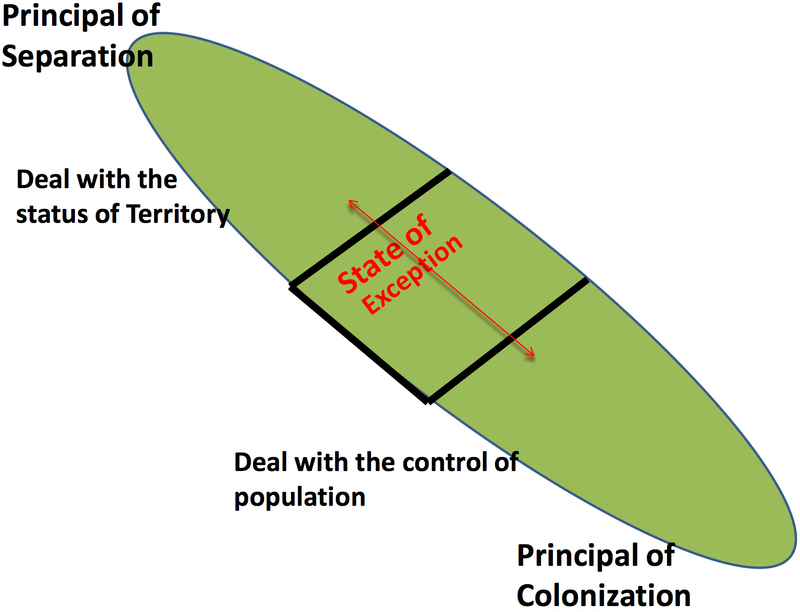 The third strategy, deployed in the face of resistance to space annihilation and ethnic cleansing, consists of what Oren Yiftachel calls “creeping apartheid.”³ Creeping apartheid manipulates increasingly impregnable ethnic, geographic, and economic barriers between groups vying for recognition, power, and resources. In 1993, during the Yugoslav wars, architect and former mayor of Belgrade Bogdan Bogdanović coined the term “urbicide” to describe the destruction of Balkan cities. Serbian nationalism romanticized rural villages, where a single community spirit could predominate. Conversely, the city, was a symbol of communal and cultural multiplicity; the antithesis of the Serbian ideal. In the Palestinian occupied territories, the entire landscape has been targeted. The weapons of mass destruction used against it are not so much tanks as they are bulldozers, destroying streets, houses, cars, and dunam after dunam of olive trees. This is war in the age of agoraphobia—the fear of space—seeking not the division of territory but its abolition. A trail of devastation stretches as far as the eye can see: a jumble of demolished buildings, leveled hillsides and flattened wild and cultivated vegetation. This barrage of concentrated damage has been wrought not only by bombs and tanks but by more industrious forms, toppling properties like a violent tax assessor. The Israeli project currently has “demographic transfer” as its objective, or what one Israeli minister has called a “voluntary transfer” of the Palestinian population by transforming Palestinian topos into atopia; turning territory into mere land. It is by means of spatio-cide that Israel is preparing such a population transfer. Already, since the beginning of the Intifada in 2000 until 2007, around 180,000 Palestinians have left the country; some 5.3 percent of the population. During the same time, 77,759 housing units were damaged by the tactic of house demolitions, of which 8,103 were destroyed completely in the Palestinian Territory.⁷ Destruction has taken place mainly in Rafah, Jenin, Nablus, Hebron and Jerusalem. Many of the refugees of these demolitions are already refugees from 1948 or 1967. Transfer is also brought about with the “de-naturalization” of some 200,000 Palestinians who have found themselves trapped between Israel’s West Bank barriers and are now neither in Palestinian nor Israeli space, but are rather de facto stateless and space-less. People have been forced to migrate internally as well. In Hebron, for instance, some 5,000 people (850 families) have left the Old City to neighboring villages because of Jewish settler vigilantism, harassment, and violence, as well as Israeli army imposed curfews. This “spatio-cide” has been rendered possible by the Israeli division of Palestinian territory into zones A, B, B-, B+, C, H1 and H2. These areas are themselves fragmented by the bypass routes system, dividing the West Bank into sixty-four small Cantons. With such a scheme, national infrastructural development is almost impossible, not just due to the fragmentation of space, but also to the fragmentation of the Palestinian political system. The Palestinian National Authority (PNA) cannot, for example, implement water reservoir projects for a set of villages if the pipeline passes through zone C. Paving of the new road between Bethlehem and Hebron was halted in 1999 because Israel did not grant authorization to pass through zone C. There has been urban development in zones A and B, but these are always surrounded by Israeli zones, curtailing the possibilities for industrial or residential urban expansion. The normalization of the state of exception in the Palestinian territories is a facilitating framework that is moderated, legitimized, and reproduced by the logic of humanitarian concern that is driven by an inverse moral aspiration, yet assumes an analogous structure of exception. For Palestinian refugee camp dwellers, humanitarian organizations fall into the trap of the Israeli sovereign power that have disqualified the life of this population from political meaning. Why are they there? Why are they not able to return? Palestinian humanitarianism is a new form, a new conception of humanity, stripped of its political meaning. The involvement of the United Nations Relief and Works Agency (UNRWA) in the reconstruction of the Jenin refugee camp after its partial destruction by the IDF in 2001 is revealing in this sense. Instead of alleviating the crowdedness of the camps by advocating for the return of refugees to their place of origin (a third of Jenin’s refugees come from the village of Zaraan, located just seventeen kilometers west of the city), UNRWA pursued two options: rebuilding the camp while respecting its boundaries, and asking the Jenin municipality to allocate a piece of land to allow for its expansion. This form of humanitarianism is spread throughout not only the Palestinian territories but Lebanon as well. In 2005, the Swiss embassy mobilized a Swiss humanitarian agency to fund a workshop with Palestinian and Lebanese experts to assess the need for Palestinians to receive more vocational training. The agency argued that with this, refugees would be able to work as qualified workers without the need to change the existing legal framework that bars them from work, denying them access to any profession and even to the formal labor market. I was a participant in this workshop and spoke vehemently against its rationale and against working within the framework of existing rights. Tensions rose, and there were many clashes between the Palestinian and the Lebanese participants. The Swiss agency then called for two ad hoc meetings: one with Palestinian experts and another with Lebanese experts. A representative of the Swiss agency told me that I was politicizing the process; she argued that her agency is a humanitarian one, and therefore cannot address the right to work for Palestinian refugees. After heated arguments, she threatened to withdraw funding. I cynically replied that there were many refugee communities in Africa that deserve more attention than Palestinian refugees, and we would be glad to divert the funding to them. One member of the Palestinian delegation was unhappy with what I had said and asked me to use “I” instead of “we.” My comments criticized the donor community for their dichotomous thinking: relief vs. development and humanitarianism vs. politics. Humanitarian organizations deprive refugees of their political existence by treating them as bodies to be fed and sheltered. Humanitarian law refers to “protected people,” but current humanitarian practices either focus on “victims” or, to appear more positive, they refer to them as “survivors.” By classifying people as victims or even as survivors, the basis of humanitarian action is shifted from rights to welfare. In disaster areas—spaces of exception—values of generosity and pragmatism obscure the rights and responsibilities of refugees that would endow them with their own agency. The consequence of this is that, denied a work permit, Palestinian refugees are forced to work in the black market under conditions of severe precarity, vulnerability, and exploitation. Indeed, the majority of Palestinian refugees of Lebanon live in poverty, which can be observed across a number of socio-economic spectra such as low income, few assets, poor housing, educational achievements, health, and others. I have been very interested in demystifying the depoliticization of humanitarianism since the beginning of the Second Intifada. When I became research director of the program “Policy and Governance in Palestinian Refugee Camps” at the Issam Fares Institute for Public Policy and International Affairs (IFI), I helped to organize lectures with practitioners from international and local organizations, further contributing to the debate on humanitarianism. When Karen Abu Zeid, the former Commissioner General of UNRWA, was invited to IFI as a guest, she too, recognized the tension between the political and the humanitarian. For her, “This tension is manifested in a variety of ways. One of its most striking manifestations is the contrast between the readiness of states to fund emergency responses, compared to their failure to address the questions of international law and politics that cause these emergencies.” That tension is clear in the way in which the urgency to resolve underlying questions of justice and peace for Palestinians is somehow divorced from the challenge of providing for their human needs. 1 Kenneth Hewitt, “Place annihilation: Area bombing and the fate of urban places,” in: Annals of the Association of American Geographers, vol. 73, no. 2, 1983: pp. 257-284. 2 Ilan Pappé, The Ethnic Cleansing of Palestine (Oneworld Publication, 2006). 3 Oren Yiftachel Ethnocracy: land and identity politics in Israel/Palestine (Philadelphia: University of Pennsylvania Press, 2006). 4 Stephen Graham, “Postmortem City: Towards an Urban Geopolitics” City, vol. 8, no. 2, 2004. 5 See PCBS release preliminary estimated for the Economic Losses in Gaza Strip caused by Israeli Aggression, ➝. 7 Source: ➝. These figures are quite similar to those calculated by the Israeli human rights organization B’Tselem, with more details distinguishing between demolition of houses as punishment, demolition of houses built without permits and demolition for alleged military purposes. See ➝. Sari Hanafi is currently a Professor of Sociology and chair of the department of sociology, anthropology and media studies at the American University of Beirut. He is editor of Idafat: the Arab Journal of Sociology (Arabic), Vice President of both the International Sociological Association and the Arab Council of Social Science, and author of numerous journal articles and book chapters on the political and economic sociology of the Palestinian diaspora and refugees; sociology of migration; transnationalism; politics of scientific research; civil society and elite formation and transitional justice.